The founders of Betches started their media company in 2011 when they were seniors at Cornell University. 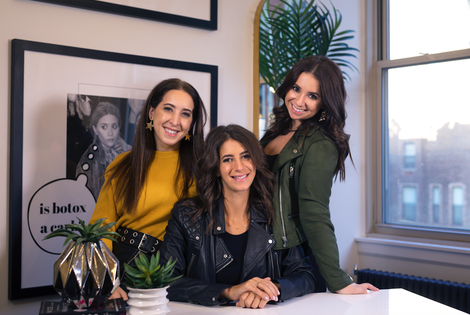 Jordana Abraham, Samantha Fishbein and Aleen Kuperman’s website catered to their peers, college-aged women and recent graduates. ”We felt like we had a unique perspective on the environment we were in and the types of people we were surrounded by – particularly the glorified ‘bro’ culture of ‘fratire’ that was big at the time,” they remember. “There was no complimentary voice to embody the female version of this type of person but we felt like we understood her.” They each invested $1500 and started writing. The founders still own 100 percent of Betches and say that the company has been profitable for more than four years. The 2019 Forbes 30 Under 30 Media List members left Cornell’s campus for their Manhattan headquarters. Today the Betches site covers a wider range of topics from news to beauty advice written in their signature sarcastic and snarky tone. “Keep up with WTF is going on in the world here, starting with our daily newsletter sent straight to your inbox. Uninformed is no longer cute, and sometimes you just need for your funny informed friend to explain what’s going on to you (that’s us, duh),” reads the description of their news and politics vertical and newsletter The SUP. They produce podcasts and video series and have a shop with clothes, accessories, home decor and other product categories. A notebook cover reads, “This should’ve been an e-mail.” A shirt declares, “I want to be where the people aren’t.” They also sell their two New York Times bestselling “satirical self help books”: Nice Is Just A Place In France: How To Win At Basically Everything and I Had a Nice Time and Other Lies: How to Find Love and Sh*t Like That. Their newest book When is Happy Hour? Work Hard So You Can Hardly Work is “a guide on how to thrive professionally, get ahead at your job, and basically become the Beyoncé of whatever you aspire to do.” The Comedy Central animated television series Betches is in the works with the founders and Emma Roberts serving as executive producers, according to the Hollywood Reporter. Betches’ revenue is predominately earned from brand partnerships that include 360-degree strategic campaign conceptualization, video production and execution, branded social and digital assets and artwork, experiential event marketing and influencer activation, according to their advertising page that also states that Betches had 2 billion impressions, more than 6 million users and 155 million video views per month in 2017. Betches has a large social media following and 6.4 million followers on Instagram alone. Although they declined to share their exact revenue, Forbes estimated that Betches’ revenue exceeded $5 million in 2017. I spoke to the founders about running a profitable media company, growing a community and their best career advice. Gross: What advice do you have for another entrepreneur who wants to scale a social media platform and publication? Gross: What advice do you have for another entrepreneur who wants to make a publication profitable? Abraham, Fishbein and Kuperman: Leverage your unique voice to align with brands on content that they will pay you for, but that will also actually offer something to your audience so you can show really strong proof of concept and generate more partnerships. Keep your team lean and don’t over-hire, and don’t spend on products or platforms that are not completely necessary so you can keep your costs down. Gross: Unlike many media company founders, you didn’t raise any outside funding. Why was that an important decision for you and what advice do you have for other founders considering bootstrapping? Abraham, Fishbein and Kuperman: Raising outside funding is something we’ve gone back and forth on for a long time, and so far, we haven’t done so because we haven’t found a situation that made sense for us from both a creative and a financial standpoint. Owning the company means we have full control of the direction that we can take it in creatively, which is extremely important to us since our creative direction is what’s gotten us to where we are. Our advice for other founders considering bootstrapping is that it’s important to know that this will likely require some sacrifices, because you’ll be putting your profits back into the company which will mean less disposable income for you. So being willing to accept those sacrifices and the struggles that can come with it is extremely important. Gross: You’ve written multiple books including your newest, When’s Happy Hour. How did you decide to tackle career advice? Abraham, Fishbein and Kuperman: The first takeaway is to keep an open mind about what you want to do with your life, and what you’re good at. Many people graduate college or even high school thinking they have their career path set, only to get their first job and realize it’s all wrong for them. The same can happen when you’re older, but if you’re always observing with an open mind how you feel about what you’re doing and what you feel aligned with, you can make better choices in your future career moves. The second takeaway is that you should always ask for what you want; the worse someone can say is “no.” Third is to never send a calendar invite without context. Gross: What’s the biggest lesson you learned at work and how did you learn it? Gross: What is the best advice you’ve ever received? Abraham, Fishbein and Kuperman: Be proactive and put in the effort. Sometimes work is going to feel awful and you’re really not going to want to do what you have to do. When all you want is to get through the next dreadful project, instead of rushing through it and doing a mediocre job, try to reframe the challenge not as a work task, but as a task that is actually helping you work on yourself, and work on not being the kind of person who does a mediocre job just because they don’t feel like it.